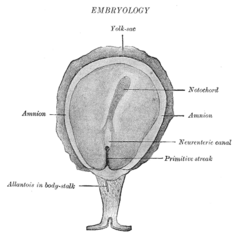 Transverse section of a chick embryo of forty-five hours’ incubation. Notochord is a flexible, rod-shaped supporting structure that is one of the distinguishing features of the phylum Chordatas, being found at some point in the life cycle of all chordates (vertebrates, tunicates, and lancelets). Composed of cells derived from the mesoderm, the notochord defines the primitive axis of the chordate embryo and is retained as the main support in the lancelets. In tunicates, it is only found during the larval stage. Among vertebrates, while the notochord is retained by the adults of the lower vertebrates of class Agnatha (hagfish and lampreys), in higher vertebrates (cartilaginous fish, bony fish, reptiles, amphibians, birds, mammals) it is replaced by the vertebral column. The notochord is found on the ventral surface of the neural tube. The appearance of notochords provided an advantage for chordates. Notochords were the first "backbones," serving as support structures in chordates that lacked a bony skeleton. The very first vertebrates, such as Haikouicthys, had only a notochord. Notochords were advantageous to primitive fish-ancestors because they were a rigid structure for muscle attachment, yet flexible enough to allow more movement than, for example, the exoskeleton of the dominant animals of that time. The higher chordates were built on the foundation of this model structure, allowing the eventually development of vertebrate. The notochord is one of the defining characteristics of the phylum Chordata, along with the presence of a hollow dorsal nerve cord and pharyneal slits. Chordata includes the lancelets, tunicates, and vertebrates, each of which differs according to characteristics of the notochord. Lancelets (suphylum Cephalochordata) retain the notochord throughout their lives and it extends into the head region (unlike the vertebrate spine) in both the young and the adults. (Thus, the name, with cephalo meaning "relating to the head.") Tunicates (subphylum Urochordata) have a notochord only as larvae, not as adults, and it does not extend into the head. In vertebrates (subphylum Vertebrata) the notochord becomes surrounded by vertebrae. In the higher vertebrates, Gnathostomata (jawed vertebrates), the notochord is only present in the embryonic stage and is completely replaced by the vertebrae in the adult. This includes Class Chondrichthyes (cartilaginous fish), Class Osteichthyes (bony fish), Class Amphibia (amphibians), Class Reptilia (reptiles), Class Aves (birds), and Class Mammalia (mammals). In members of the vertebrate class Agnatha (jawless fish), the hagfish and lampreys, the notochord remains throughout life and is the first primitive vertebral column. Hagfish are unique in that, despite generally being classified in Aganatha as primitive vertebrates, they actually lack vertebrae. Unlike vertebrates, cephalochordates and tunicates lack a backbone or vertebral column. In the adult human, a notochord remnant is the nucleus pulposus of the intervertebral discs. Notogenesis is the term used for the development of the notochord by the epiblasts that make up the floor of the amnion cavity (Schöni-Affolter et al.). The notochord arises as a pouch from the mesoderm. Research into the notochord has played a key role in understanding the development of the central nervous system. By transplanting and expressing a second notochord near the dorsal neural tube, 180 degrees opposite of the normal notochord location, one can induce the formation of motoneurons in the dorsal tube. Motoneuron formation generally occurs in the ventral neural tube, while the dorsal tube generally forms sensory cells. The notochord secretes a protein called sonic hedgehog homolog (SHH), a key morphogen regulating organogenesis and having a critical role in signaling the development of motoneurons (Echeland et al. 1993). The secretion of SHH by the notochord establishes the ventral pole of the dorsal-ventral axis in the developing embryo. Section through the head of a human embryo, about twelve days old, in the region of the hind-brain. Echelard, Y., D. J. Epstein, B. St-Jacques, L. Shen, J. Mohler, J. A. McMahon, and A. P. McMahon. 1993. Sonic hedgehog, a member of a family of putative signaling molecules, is implicated in the regulation of CNS polarity. Cell 75(7): 1417-30. PMID 7916661. Retrieved November 2, 2008. Schöni-Affolter, F., C. Dubuis-Grieder, and E. Strauch. n.d. [Genesis of the notochord. Human Embryology. Développé par les Universités de Fribourg, Lausanne et Berne (Suisse) sous l'égide du Campus Virtuel Suisse. Retrieved November 2, 2008. This page was last modified on 21 November 2008, at 03:06.